This royal hunting-lodge was first mentioned in 1137 and became for nearly 350 years the chief palace of the kings of France, who were attracted by the hunting afforded by the Forêt de Bière. The present château dates from the rebuilding and enlargements of Francis I started in 1528 and from the modifications undertaken by subsequent sovereigns until 1868. As a result of this piecemeal construction, Fontainebleau is a complex, irregular structure of different dates and styles. 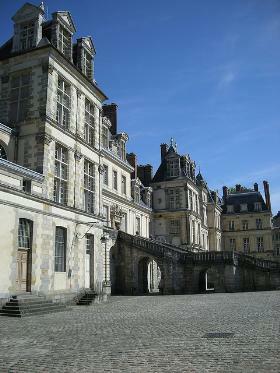 In April 1528 Francis I commissioned a programme of building at Fontainebleau. The Cour de l’Ovale was to be rebuilt using the old foundations and retaining the old keep, while a gallery, now the Galerie François I, was to be constructed linking this with the Trinitarian abbey to the west, which was soon demolished and replaced by the Cour du Cheval Blanc. This was named after a plaster cast (untraced) of the horse from a statue of Emperor Marcus Aurelius in Rome. The first floor of the Cour de l’Ovale has a Corinthian order of flat pilasters, and the tall roof is pierced by large dormers with triangular pediments. A colonnade was added in 1541 and runs round most of the ground floor. The medieval gatehouse in the south-west corner was rebuilt in Renaissance style, based on the entrance to the ducal palace at Urbino. 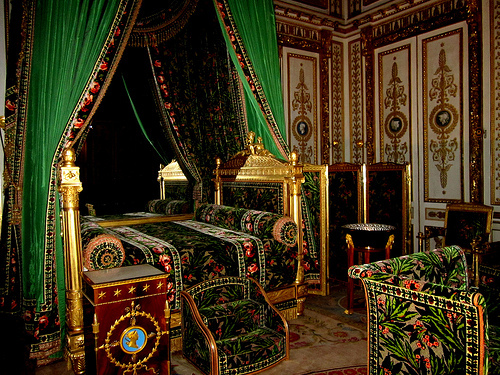 At the châteaux of Blois and Chambord, Francis I had favoured a rich external decoration with the internal walls left bare for tapestry. At Fontainebleau, however, this was reversed: the façades are of an austere simplicity, as the stone used was unsuitable for sculpture, while the interior received rich and permanent decoration. The most complete interior surviving from Francis I’s reign is the gallery bearing his name on the first floor of the block that joins the Cour de l’Ovale to the Cour du Cheval Blanc. Another survival of Francis I’s period now forms the upper storey of the Escalier du Roi. 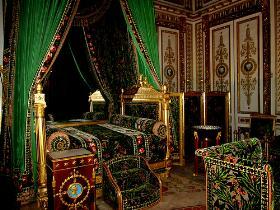 This was the bedroom of the Duchesse d’Etampes, containing frescoes of Alexander the Great set in stucco frames. By the death of Francis I, Palace of Fontainebleau had acquired much of its present appearance: the Cour de l’Ovale, the Cour du Cheval Blanc and the gallery that joined them were all begun and mostly completed, while the Cour de la Fontaine, with the Galerie Francois I to the north and a range of kitchen buildings ending in the Pavillon des Poêles to the west, was not. Catherine de Medici commissioned Primaticcio to enclose the Cour de la Fontaine on the east by what became known as the Aile de la Belle Cheminée. 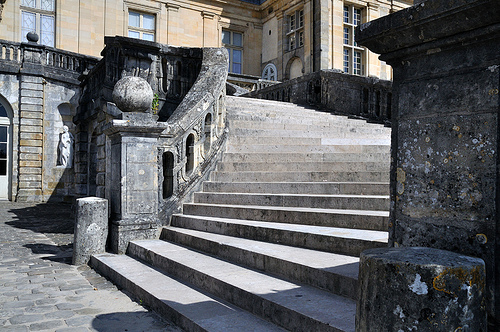 He produced what is perhaps the most distinguished façade in the whole palace, fusing French and Italian style with a double flight of steps against the central block between the end pavilions. It was to set the style for the whole Cour de la Fontaine. Henry IV made considerable alterations and additions to Chateau de Fontainebleau. He enclosed a new courtyard (begun in 1599) to the north of the Galerie François I and Cour de l’Ovale around the Jardin de la Reine (1l; now the Jardin de Diane). 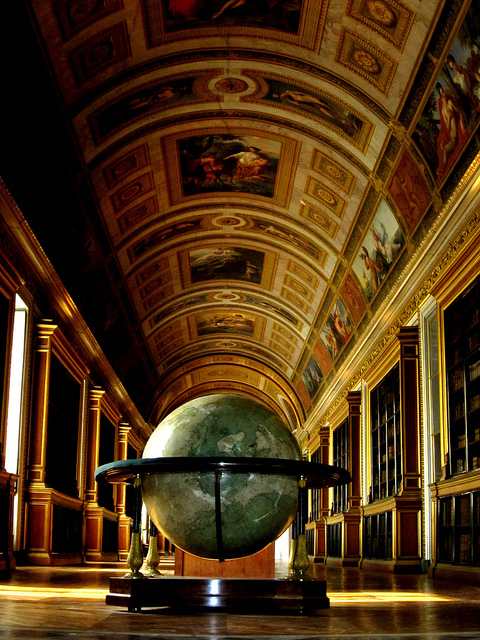 The only part to survive contains the Galerie des Cerfs on the ground floor with the Galerie de Diane above. 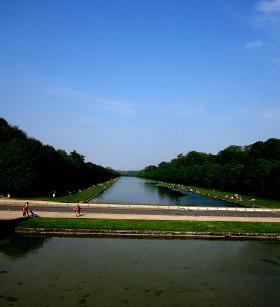 The Jardin de Diane is now named after the Fountain of Diana, the plinth of which bears bronze figures by Pierre Biard. The east side of the Cour de l’Ovale was made into the main entrance by straightening out the wings and bringing in a triumphal arch, originally in the Cour du Cheval Blanc, and now crowned with a square dome. Further to the east Henry built the Cour des Offices, designed by Rémy Collin, with one- and two-storey ranges around three sides of a quadrangle and its main entrance in the form of a heavily rusticated niche. 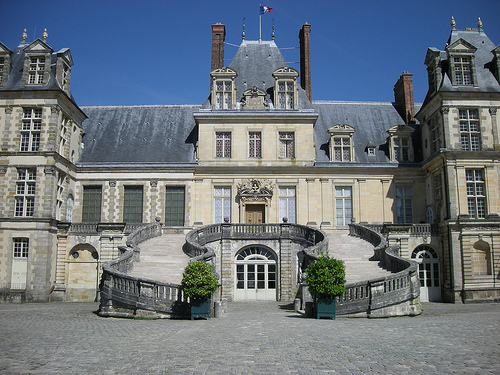 Henry also refaced the south front of the Galerie François I and, by means of some remodelling, continued this more dignified architecture round to Le Breton’s west front overlooking the Cour du Cheval Blanc. 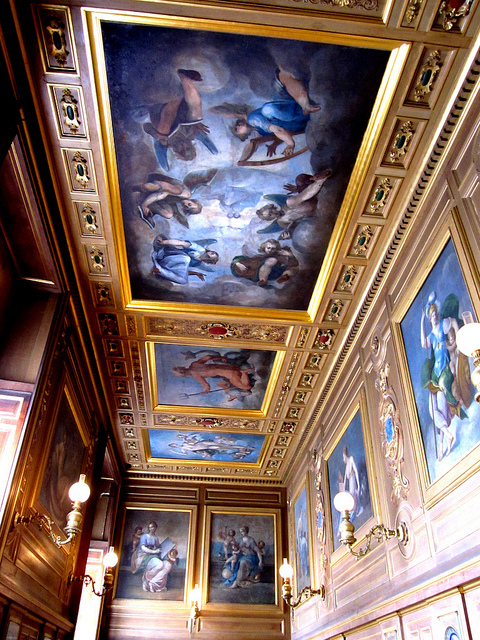 Under Henry IV the decoration of the interior was entrusted to a team of artists, mostly French or Flemish, supervised by Martin Fréminet, Toussaint Dubreuil and Ambroise Dubois. 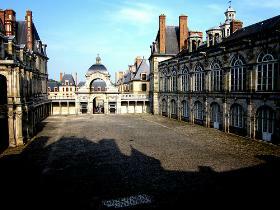 Together they formed the second Fontainebleau school. The most important of their works to survive are the ceiling and high altar of the chapel of the Trinité. Designed by Fréminet, the long vault, enriched with paintings set in stucco frames by Barthelemy Tremblay, lends great magnificence to the chapel. Outside the château Henry IV created an island garden, the Jardin de l’Etang, in the lake in front of the Cour de la Fontaine, laid out as a parterre de broderie. 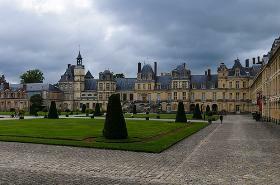 He also built a pavilion in the middle of the lake and laid out the Parterre du Tibre south of the Cour de l’Ovale and the Cour des Offices. It was so called because of the statue and fountain at its centre. 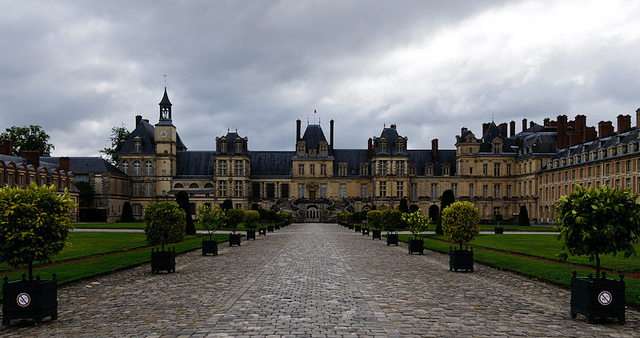 Fontainebleau was by far the finest of his palaces. 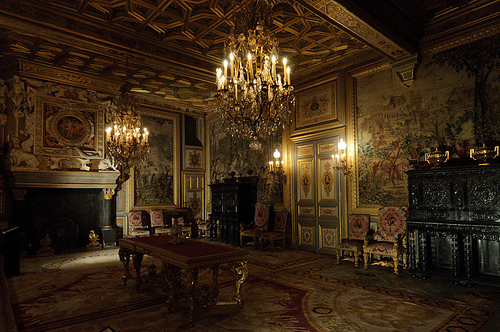 In 1685 he created the beautiful apartment with white and gold decoration in the Pavillon de la Porte Dorée for Mme de Maintenon, and he also enlarged his own bedroom . 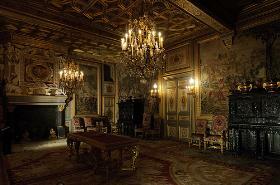 Louis XVI made considerable alterations to Fontainebleau, including the addition of his own Petits Appartements and the redecoration of two of the rooms of his queen-consort, Marie-Antoinette. 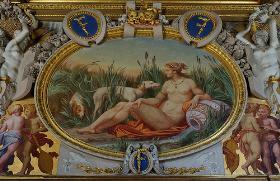 He ordered the sumptuous meuble d’été, which is today in her bedchamber. 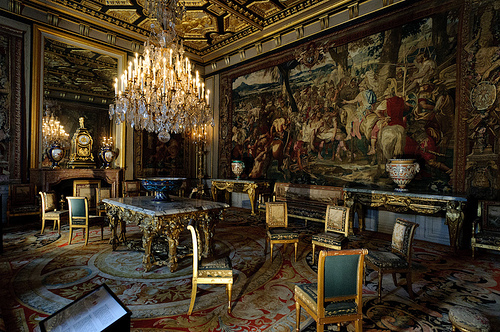 The Salon de Jeu, designed by Richard Mique, was in the fashionable Pompeian style. Overdoors in trompe l’oeil by Piat-Joseph Sauvage and a ceiling painted by Jean-Simon Berthélemy completed the decor. The same team created Marie-Antoinette’s Boudoir, perhaps the most perfect piece of interior decoration in the whole palace, where stucco reliefs over the doors complement the panelled walls painted with grotesques. 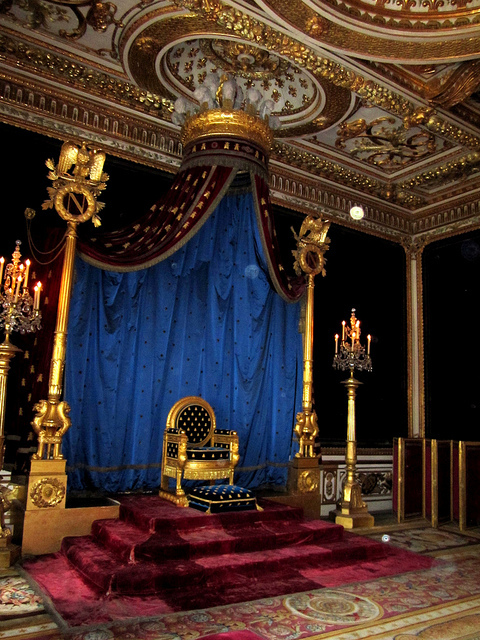 In 1804 Napoleon I, Emperor of the French, made his Throne Room in Louis XIV’s bedchamber, substituting for the bed a throne designed by Charles Percier. It was in Louis XVI’s Petits Appartements, however, that Napoleon made his most important redecorations in 1808. The rooms retained most of the original fireplaces, panelling and architecture, into which framework were inserted new hangings and furniture in Empire style. Under the Third Republic an enormous programme of restoration began in 1924, largely funded by John D. Rockefeller jr, followed by a second campaign between 1964–1968, stimulated by André Malraux, which undertook, among other things, the very difficult further restoration of the Renaissance frescoes. A tour at the Grands Appartements including the Throne Room (Francis I Gallery) will take 2 hours. Audio tours are available until 15.30 in the winter and 16.30 in the summer. 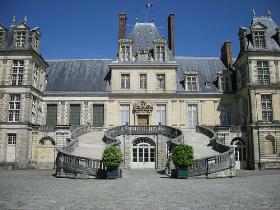 Garden Tours: French garden-Grand Parterre, and the English Gardens: the Jardin de Diane and the Jardin Anglais. Audio tours also available. It is recommended to book your visit in advance especially for the guided tours.